I’m a huge fan of recycling, or upcycling or whatever the in-term is at the moment. There’s something so satisfying about transforming old, abandoned, scruffy, broken items into loved, treasured and beautiful things. My kids are terribly embarrassed by their magpie mother, if I walk down a street I always keep a close eye out for sparkly things – whether that be pop can tabs which can be spray painted and daubed with nail varnish to make bracelets, odd earrings, scattered beads from snapped necklaces, nuts, bolts, washers, straggly ribbon blown by the wind and caught in spiky bushes….anything really. I’ll often go into a shop and fish out the change in my pocket, only to find the spare change is outnumbered by small metal objects that can in no way be exchanged for a can of pop or a pint of milk. Here’s a few things I treasure, all found objects. Laugh if you must, maybe it’s not normal. 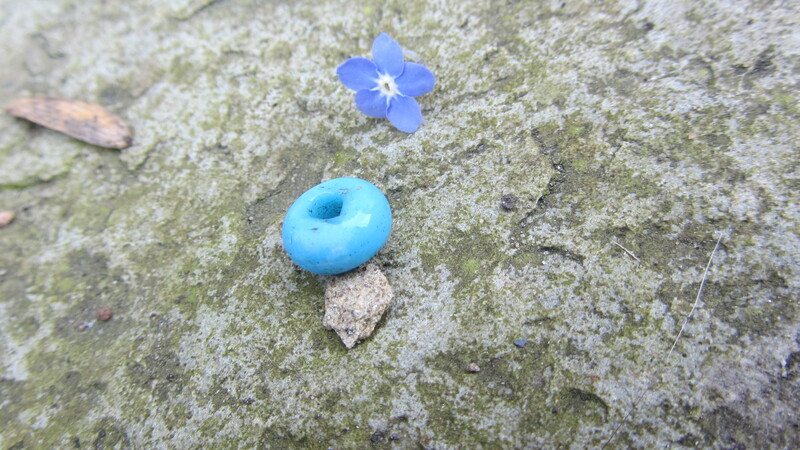 A turqouise glass bead I found by a riverbank on a dog walk. An archaeologist friend of mine said that beads such as this can sometimes be from the iron age, but then again, it could just as easily be from a broken bracelet from Accessorize, lost on a sunny day spent by the river. Who knows? I love it because it was lost and rolling around amongst the rocks, and now I can make it into something pretty again. I’m not enthralled with this bee to be honest. It’ll probably be pulled in pieces and made into something else, but I do love what the abdomen is made from. I found it squished in the middle of the road, probably run over by a million and one cars. If you look carefully you can see the image of a pylon-like tower with zig zags coming out of the top that look like the symbolize radio waves. At the bottom it says ‘BBC’ so I’m presuming it was some sort of promotional pin badge. This is almost impossible to see on this photograph by the way, it’s hardly visible because of the damage. Say what you like about the bee, it’s not great, but the pin badge did make a fabulous bee’s bum, or at least I think so. I think this is called a nut? Not as in hazelnut obviously, more of an industrial ‘nut’, most probably used with a bolt to secure things to things. I’m very vigilant when I walk past garages and where people fix cars outside their houses, because there’s a higher llikelihood of finding strange little odds and ends that I can scavenge. The next pic shows what I made from it. 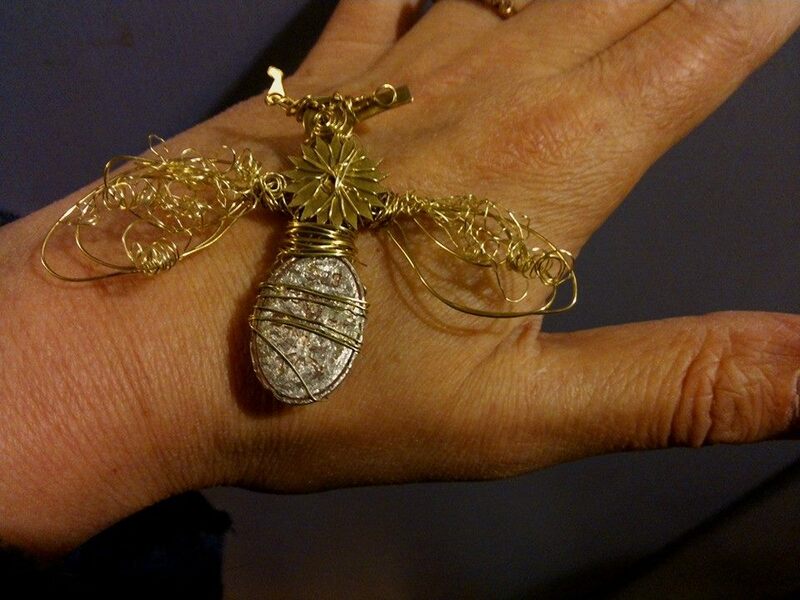 I turned the ‘nut’ into a pendant after gluing and wireworking random bits and pieces onto it. The copper coloured central ring and the metal outer ring were also just picked up off the pavement in passing. Maybe it’s the remains of the ‘Hunter/Gatherer’ instinct. The same reason why it’s so therapeautic to spend hours picking masses of blackberries from hedgerows, when you could easily just bob down to the grocers and buy a box of them for not very much money and save yourself the trouble of purple stained clothes and thorns embedded in fingertips. I could just buy supplies from craft shops, or simply spend a couple of quid on pre-made jewellery from shops, but there’s no challenge in that. Besides, I can make things that I can actually see in my mind’s eye, and they’re unique. If you’re willing to invest a bit of time pulling things in pieces you can find all manner of things too. I had so much fun disembowelling a bedside clock a while ago. It was broken and ugly so I didn’t feel guilty ripping it in bits. After messing around with a screwdriver, ripping off the facade and rooting around amongst the innards, I found all these gorgeous little things. 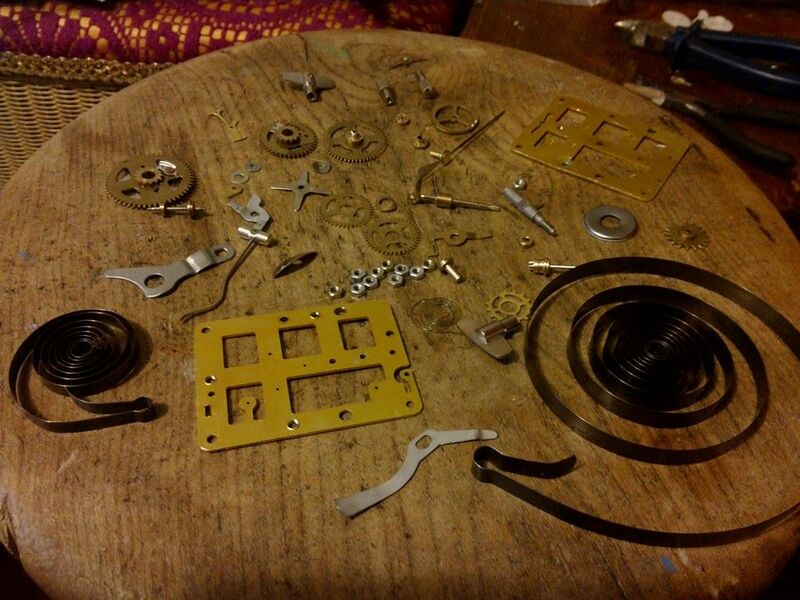 I never imagined a dissected clock could be so interesting! 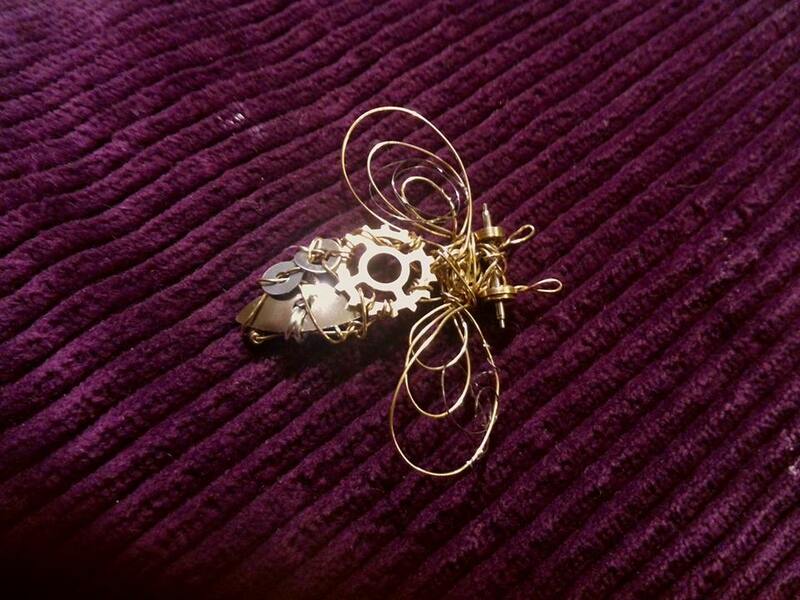 I ‘sewed’ some of the clock to a wirework bee I made. All held in place with the wire you can sometimes find wrapped around corked wine bottles. It’s just so much fun, and so fascinating to see what you can do with something and nothing. My dad used to play a game where he’d draw a squiggle on a piece of paper, then my sister and I would take turns trying to make little pictures out of them. That’s all I do with metal and wire really. I just pick something up, look at it, turn it round, put it on something else, attach it, embellish it somehow and then it becomes something else entirely. Make no mistake, this doesn’t always work. I’ve made some monstrosities in my time. 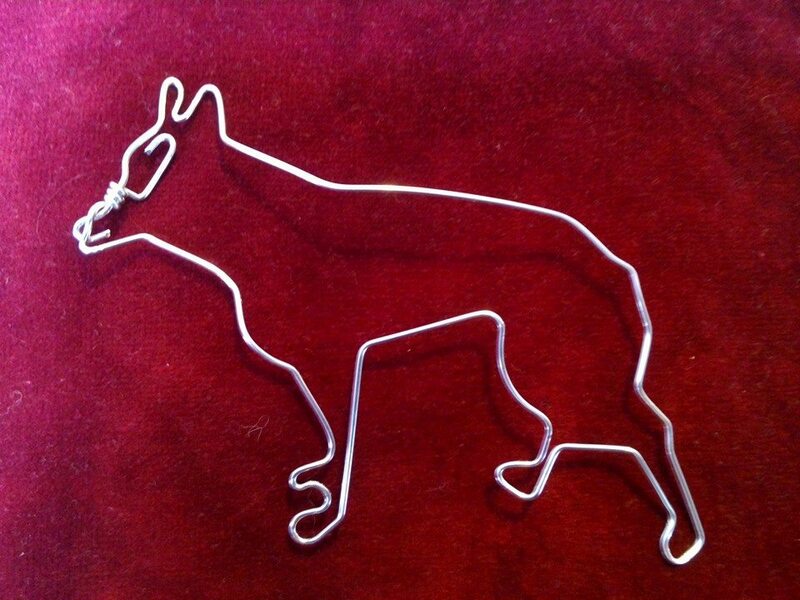 I tried to make a german shepherd out of wire once, and it ended up looking like a weird dog wearing baggy pants, a friend said that it looked like a canine MC Hammer. Here it is for your amusement and my embarrassment…. Dog wearing pants that are far too big for it. I was trying to copy a sillhouette and it just didn’t work at all! Anyway, I digress. This is just an example of how doodling with metal can be fun. It doesn’t always come naturally to me, but because I love it, so I persist, sometimes it works, sometimes it doesn’t. 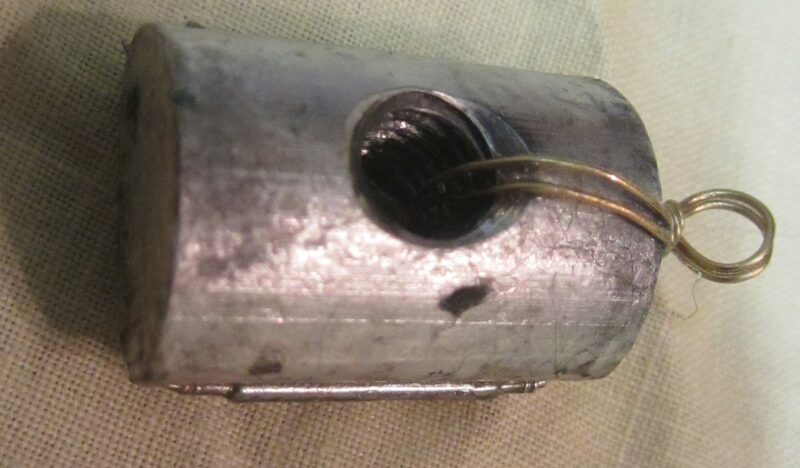 The point is, from just a piece of wire, or an abandoned bit of tatt, you can come up with all sorts of things. Silver or gold, or expensive materials are things of beauty, you can’t deny that….but I’m actually proud of the lowly roots that make up many of my creations. I’ll proudly boast that something is made from a broken hair clip and feel absolutely no shame about it at all. Life’s about making things up as you go along, or at least it is for me. You find the sparkle on the pavement, the simple little things that make up a day and turn them into something good and worthwhile. That’s the idea anyway. 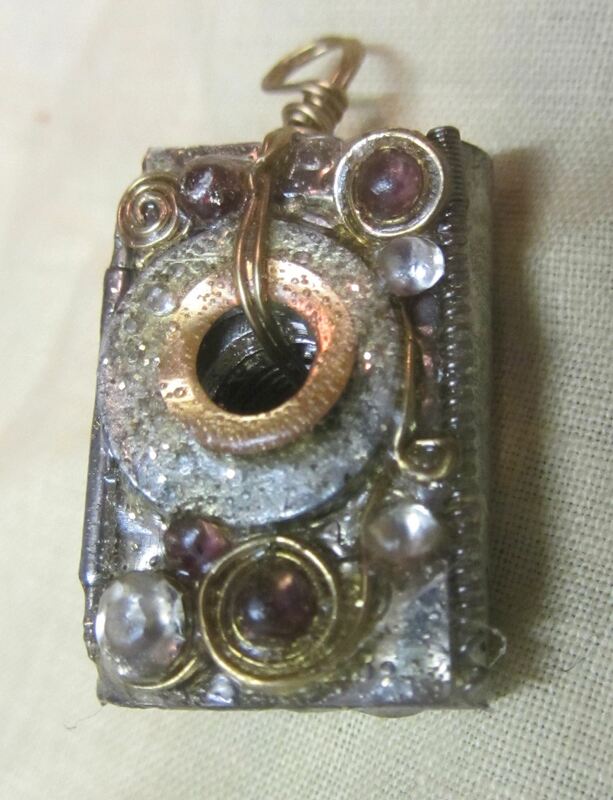 This entry was posted in Craft Projects and tagged Craft, metalwork, Recycling, upcycling. Bookmark the permalink.